That’s enough to have kept me at home for the last two working days, as I’d rather not inflict the office with my hacking cough. Going and helping with a burn-off up on the farm on Sunday probably didn’t help. But it was certainly interesting to a city boy like me. 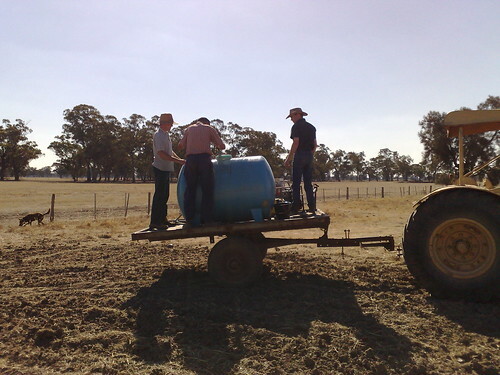 It wasn’t fuel reduction, but apparently to prepare for the next season’s sowing. After getting a permit to burn, and warning all the neighbours, we headed out with a tractor pulling a chain with a plough thing loaded with burning straw, and a smallish bulldozer with a water tank and pump, ready to put the fire out if it got out of control. It didn’t — the fire breaks had been prepared well, and there was just the right amount of breeze to keep it going but not let it go too far. So while we were on standby for fire-fighting, in practice it just meant standing about chatting (me taking photos), and every so often climbing on the back of the trailer with the water tank to be towed off after the fire-lighting tractor, trying not to get in the way of too much of the water splashing around out of the top of the tank as we bumped along. The smoke got everywhere, of course. We tried to stay out of it, but it went right through our clothes, which all needed washing. After a couple of hours, a fair bit of ground had been burnt off, ready for the next stage of preparation for planting, and we headed back to the house for some well-earned afternoon tea. Are you sure you don’t have Whooping Cough? It seems like that’s REALLY going around lately. Whooping cough?! Err no, I don’t think so. EVERYONE has that cold, I’m on day 9 and just as I start to feel better I sneeze or cough and that feeling of almost feeling better is shattered.